Founded here, 1877, with funds left by Robert Ogden, local businessman. Filled educational gap, as there were no public schools here until 1882. Prep school accredited in 1919. Ogden's criteria: regular attendance, gentlemanly deportment, diligent study. consolidated with Western Kentucky University, 1927. 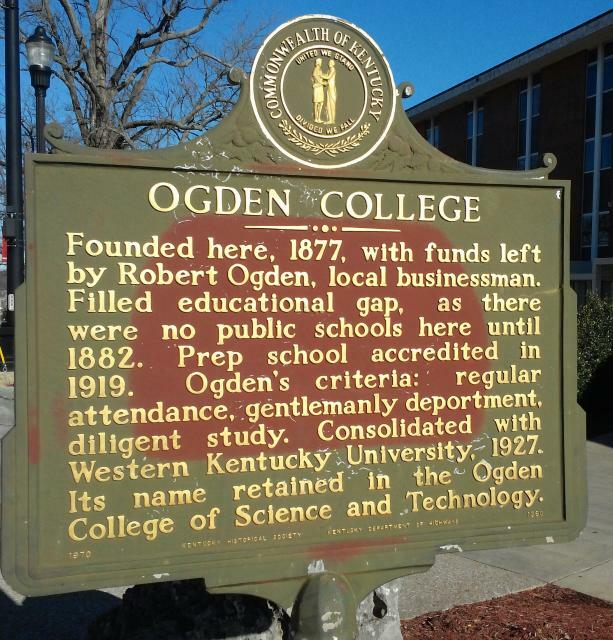 Its name retained in the Ogden College of Science and Technology. This marker can also be identified by its HM code. You can use the hashtag #HMW26 in tweets, and any other place where you might refer to this marker, including when searching on this site.